When it comes to the summer time, you definitely want somewhere that you can call your paradise.And it’s an added benefit if that paradise is close at hand – such as in your own backyard. There are ways that you can achieve this. Keep these tips in mind and then work with a professional landscape designer who can transform your visions into reality in your yard. You will find that the rest of the neighborhood will be jealous of your wonderland while they are baking in the hot summer sun. Always plan it out. You want to know what you have, the space you have to work with, and maybe what it is you want when it comes to lay out the area in the back. Find out where the most shade hits as well, since this is something you want to note for later. Having shady spots to relax on warm days means you’re more likely to use your yard when even when it’s hot. How is the space going to be used? Is it just you? Is it the whole family? Will you have lots of guests and entertain? You may want tree houses or even porch swings, depending on the uses. Think about how much maintenance you want to do before planning the details of the project. Some bigger projects like pools require maintenance, while other smaller ones require minimal work.There are also features your landscaper can add that will cut down on watering and lawn-mowing tasks. Choose items that promote conversations. Something different such as natural stone patio furniture pieces that ALD offers might bring up conversation since they are custom made. For instance, the fire and water table here in this picture incorporates a number of elements, and the table itself is liable to spark a discussion when you sit down with your guests. 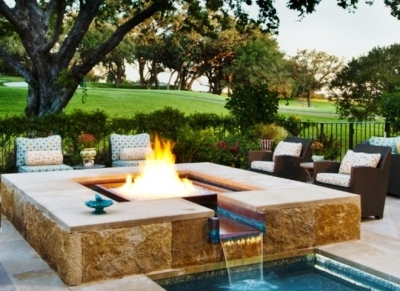 Think about adding a nice fire pit or freestanding fireplace. This can be a great place to come together, laugh, and share some stories at the same time. You’re then able to sit outside well into the night hours. Add a garden of fruits, vegetables, or flowers to add a little something to the mix. This is always a good thing when you want to make your backyard pop out from the rest. Bring music to the backyard when the time comes. You can add speakers throughout the patio in the back or even on trees. This can set the mood and allow you to have a good time. There are even TVs that can be used outdoors. Add a waterfall or fountain of some sort. The sound of the water is relaxing and the look of a waterfall can be beautiful in any type of landscape out there. Note that the fire and water table in the above picture incorporates a waterfall – a unique touch! Always make sure you have room to do different things. If you want to play games in the backyard then you a more open area. With the right amount of room, the options are endless on what you’re able to do. You might even consider installing a bocce ball court or setting aside an area for volleyball or badminton. Find out what ALD can do for you and the backyard landscaping space that you would like to have. With this in mind, you can then move forward with everything and know that you’re getting the best without having to worry about a thing. The professional MN landscape design artists can walk you through and create a paradise all your own. Contact us today to set up an appointment.